Deltas are fan-shaped sediment deposits formed where rivers enter a body of standing water. 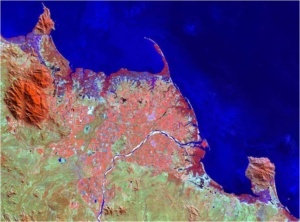 They range from a few km, like the King River Delta in Tasmania, to across to several hundred km, such as the Ganges-Brahmaputra Delta in Bangladesh. They are often important locations for the rise and sustaining of human civilisation, such as the Nile, Tigris-Euphrates, and Rhine deltas. 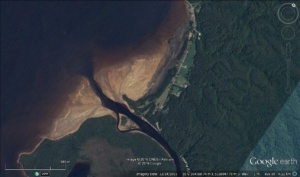 The small Delta of the King River, Tasmania (Google Earth image). 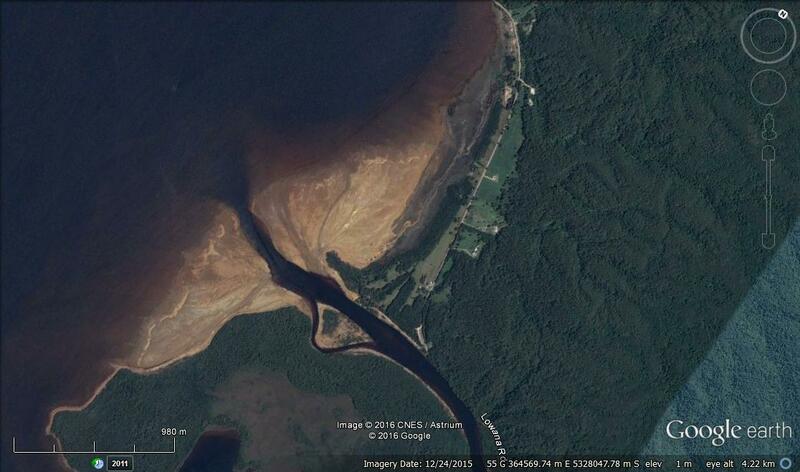 The sedimentary processes that operate in deltas are very favourable for the accumulation of organic matter. Many ancient delta deposits now host coal deposits, such of the Appalachian mountains in the United States. Oil and gas are also generated with delta successions, often while the delta is still active, as occurs with the Mississippi, Mahakam, and Niger Deltas. For this reason ancient deltas that have been observed on Mars are of great interest as sites where organic matter from ancient martian life may have accumulated. Therefore martian deltas have been proposed as targets for past and future missions such as Curiosity and the 2020 rover. 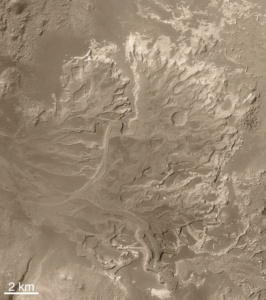 A good example of a Martian delta is found in Eberswalde Crater, while another is exposed in Jezero Crater. Both these deltas have been partly exhumed. Good exposures of fine-grained and clay rich deposits occur at both sites and rovers could drive up and sample the outcrops for analysis on site or return to Earth. We know from our experience with terrestrial rocks that the fine-grained delta sediments can preserve organic molecules (and microfossils) for hundreds of millions or even billions of years. 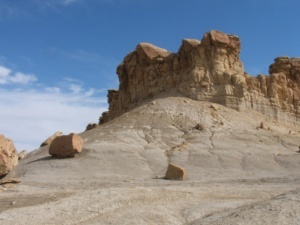 Skyline Rim is a prominent cliff of Ferron Sandstone that runs north-south east of MDRS. The Ferron Sandstone was deposited by a series of Cretaceous deltas that have been extensively studied by many researchers because of their excellent exposure and significance as a host for coal and gas accumulations elsewhere in Utah. 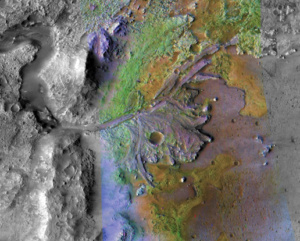 Mars analogue researchers can study how deltas are expressed in the field and use the organic-rich sediments to test instruments that analyse for organic molecules. Researchers from NASA and ESA have done so on previous expeditions to MDRS. 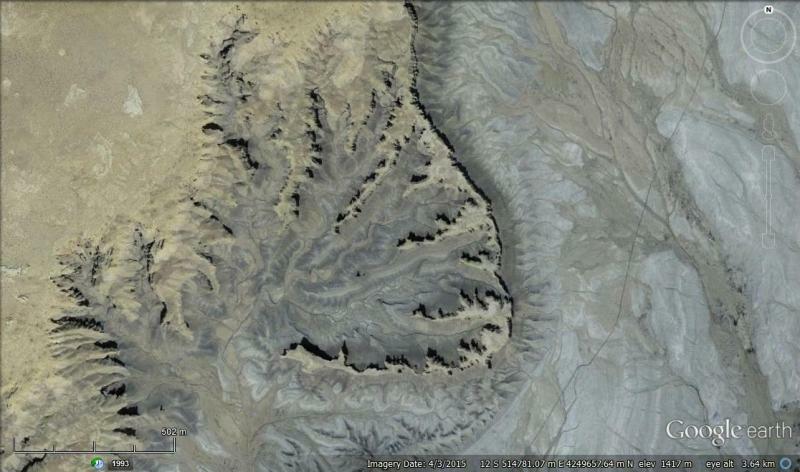 We too will be examining some of these deposits over the next couple of EVAs.